With Costing enabled in vintrace you can add or adjust the cost of fruit at any time. Generally it is easiest to set up the costing before, or during harvest but we also have the capability to retroactively apply costs to fruit after harvest. 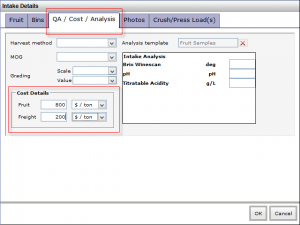 The costing will transfer through the system automatically when the fruit costs change, so it doesn’t matter when the costs are added or how blended the wines have become. Tip: Clicking on any image will open it up in a new window at full size for you. We’ll start off by describing how you can add the costs at various stages in the system. 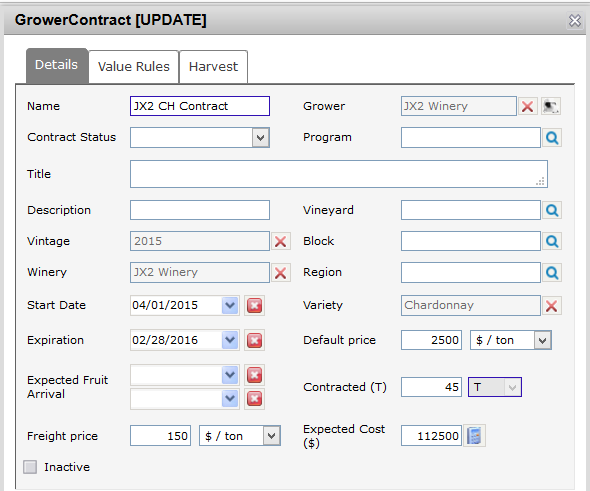 A grower contract allows you to configure a price paid for fruit either per tonne/ton or per area unit and then relate this to any number of properties including; Grower, Vineyard, Block, Varietal etc. These are accessible under Winery Setup – Production – Grower Contracts. You can set the default price, but more importantly, you can override this based on a Quality or Metric grading by utilizing a grading scale. For example, let’s assume your default contract for 2014 Chardonnay is $2500 per tonne. If this fruit is evaluated by Brix at the scale and given an <22 grade, and your contract pays less based on that scale, you can have an overriding price in the Graded prices section for the amount. 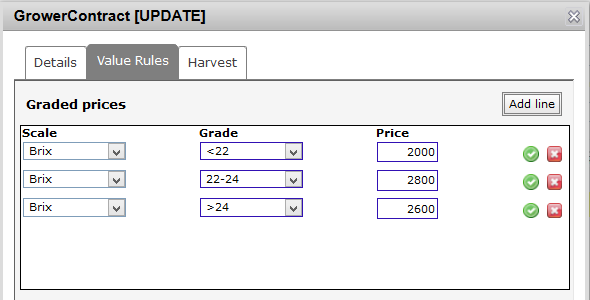 You can also configure a default Freight price that will be added to the fruit as it’s received over the scale. When recording a delivery of fruit the contract will be set automatically for you if it matches the fruit being received. You’ll see this on the Cost / QA / Analysis tab of the delivery information. You can manually override both the fruit cost and freight cost on this screen if you like. During harvest you can assign costs to fruit during the fruit intake; to do this, head into the Cost / QA / Analysis tab. If you have Grower contracts assigned, the cost details will already be filled out; if not, you can manually enter how much this fruit costs if you know at the time of delivery. These figures can be adjusted later if required. Locate the booking within the fruit intake console and click the Correct button, select the delivery you wish to add/modify costs on and view it. Once here you will need to head into the QA/Costs/Analysis tab, while correcting the booking there will be a check box you will need to check called ‘Adjust cost’. Check this and enter in the costs as appropriate. 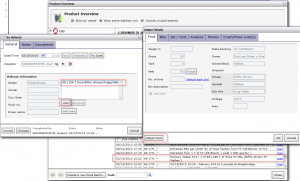 Via the Product Overview – History or Costs tabs. You can add costs manually to each delivery by looking at a wine’s Relevant history from the Product Overview History tab and locating the Intake/Delivery summaries. Note: selecting “Intake Delivery” from the drop down next to relevant history helps find these more easily. 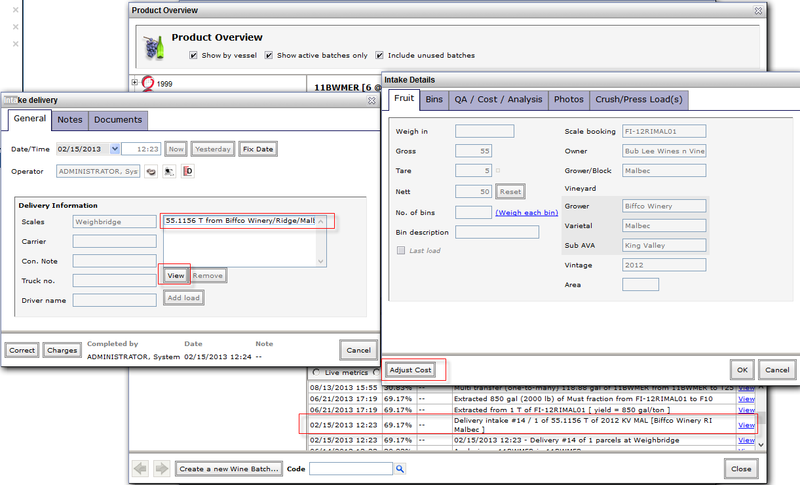 Click on the View option to see a read-only view of the Intake/Delivery data entry screen. Click on the View option for each load of fruit and use the Add Cost button to update the costs accordingly. This is slightly different from the costing options available in the Fruit Intake console, in that you can add/adjust any cost category. Finally, if you have a large amount of fruit costs to be added, you can submit a csv file to us for upload. You can run the Grape Delivery Report located under Winery Reports – Vintage/Harvest to get a detailed list of all fruit arrivals for the previous vintage/harvest. 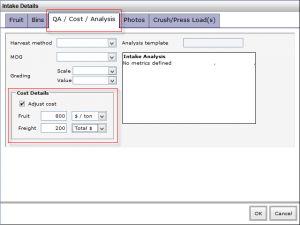 You will want to change the Format option to CSV to output the report into your spreadsheet package of choice. Add column called “Cost” and enter the total cost against each fruit parcel received for the year. Once that’s done just email the updated spreadsheet to us at support@vintrace.com and we’ll upload the costs for you. The costs are backdated to harvest and will ripple forward through all the affected wine batches.